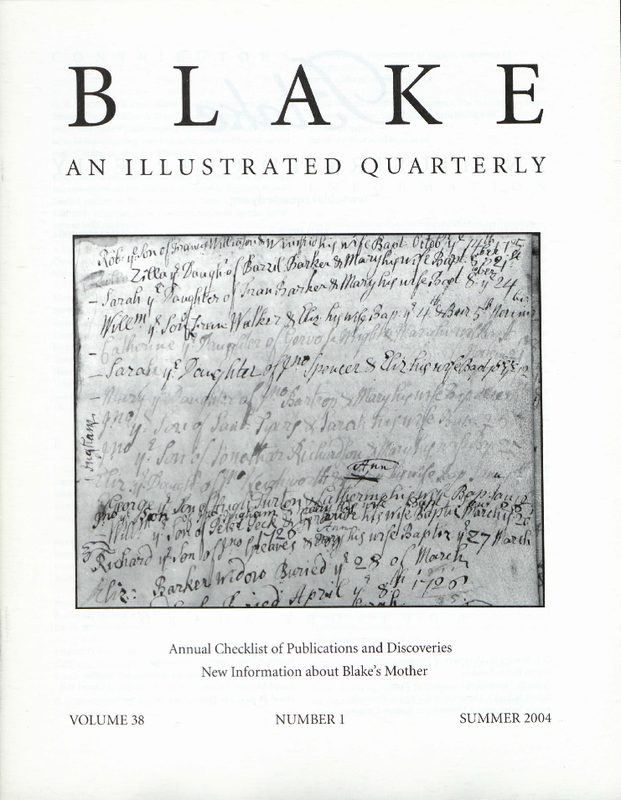 G. E. Bentley, Jr.’s most recent Blake publications are The Stranger from Paradise: A Biography of William Blake (2001, 2003) and Blake Records, second edition (2004). As of press time, he is scampering after Drs. Schuchard and Davies on the trail of Blake’s mother as a Moravian. Andrew Lincoln teaches in the School of English and Drama, Queen Mary, University of London, U.K. He is interested in Blake’s debt to the Enlightenment. Marsha Keith Schuchard, an independent scholar, received her Ph.D. from the University of Texas at Austin. Her research focuses on the influence of Sabbatian Kabbalism, Illuminist Freemasonry, and Swedenborgianism on eighteenth-century authors and artists. She recently published Restoring the Temple of Vision: Cabalistic Freemasonry and Stuart Culture (Leiden: Brill Academic, 2002), and is presently completing Why Mrs. Blake Cried: William Blake and the Sexual Basis of Spiritual Vision (London: Random House, forthcoming). Cover: Parish register of Walkeringham, Notts., 1725. Used with the permission of the principal archivist, Nottinghamshire Archives; PR 587. See page 42.